As with everything, there are always a few exceptions to the rule. The challah gods shine brightly upon me for some reason. I can usually make a good challah. Regular old white bread seems to like me as well. Things really start taking a turn for the worse when I experiment with different types of flours like wheat or spelt, or adding ingredients such as flaxseed or chia seed or rolled oats. For now, here is the most perfect-est of perfect challahs. It has a wonderful cinnamon flavor and is only slightly sweet. The flavors are subtle and not too in your face. 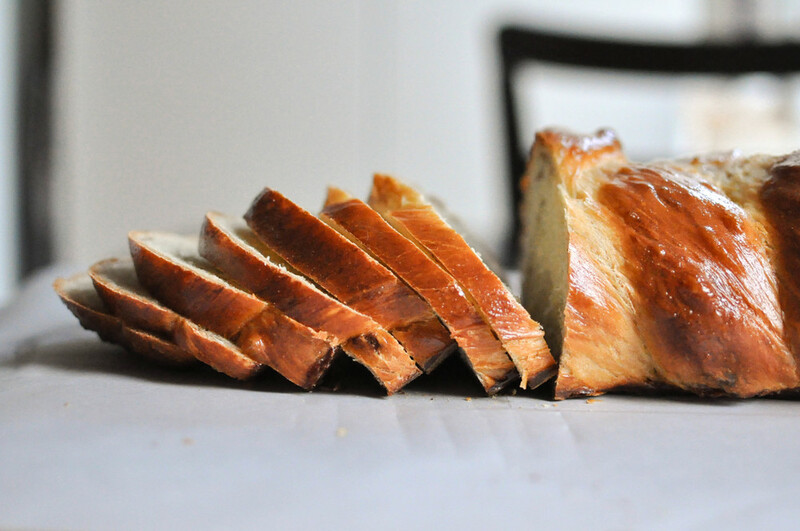 We're not looking to make a cake, just a fun twist on a classic challah. One of the mistakes I used to make was getting overzealous with activating the yeast and proofing the dough. I used to think the warmer the better with everything. In hindsight, I was probably killing half my yeast because I was using water hotter than 120 degrees F in the hopes that it would make the yeast work more quickly, then I would placed my dough in a warmed oven to rise. When I baked the dough, it would either stay a dense brick because the yeast was on its last leg or it would collapse because it was overproofed. Lesson learned. Always err on the side of cooler and slower rather than hotter and faster. Start with the lesser amount of flour, it may be all you need. Add more only as necessary and combine well after each addition. Stale cinnamon sugar challah makes a great french toast. Mix yeast, water, and a teaspoon of sugar in the bowl of a stand mixer. Let sit for 10 minutes. After a few minutes, you should see the yeast start bubbling. When there is a thin and filmy layer on top, the yeast has been activated. Place bowl in the mixer with a dough hook. Add the rest of the sugar and mix until incorporated. Add a cup of flour and mix. Add the 3 eggs, making sure to break the yolks, and continue mixing until combined. Add another cup of flour, mix again. Then add oil and salt and mix once more. Add the remaining 2 & 1/2 cups flour and mix on low to incorporate. Increase the speed to medium low and mix for about 10 minutes. During that time, turn off the stand mixer at least twice to scrape down the sides of the bowl. After scraping a few times, the dough should start clearing the sides of the bowl, if not, add some more flour a tablespoon at a time, mix well after each addition, and scrape down bowl. The dough might still stick a little to the bottom and sides of the bowl, and that's okay. Turn the dough onto a lightly floured surface and knead by hand for one minute. After kneading by hand, the dough should be very soft, supple, and just slightly sticky. Place in a well oiled bowl, cover with a clean kitchen towel, and let rise for 1 & 1/2 hours, until it has tripled in volume. Mix sugar and cinnamon in a small bowl. Turn the dough onto a lightly floured surface and divide into 3 equal pieces. Roll each piece out with a rolling pin until the strands are about 4 inches wide and 20 inches long. 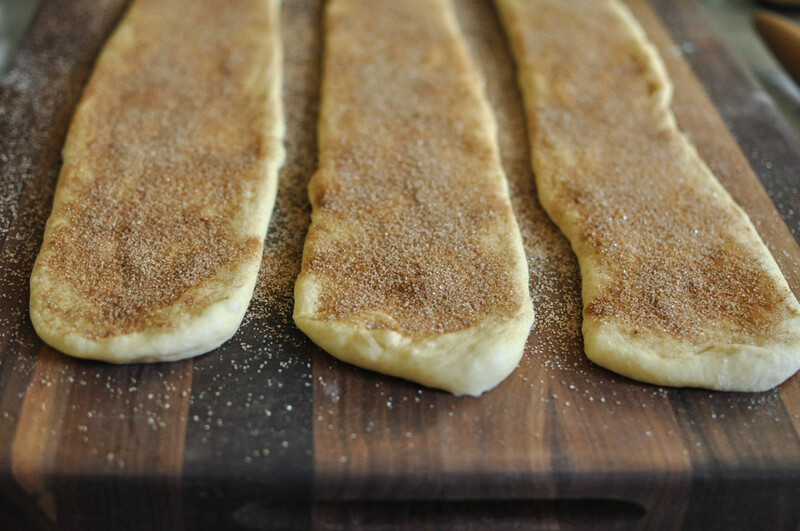 Sprinkle a layer of the cinnamon sugar on each piece of dough. Fold each piece of dough in half, lengthwise, and pinch the ends together. While pinching, try not to trap any air inside the dough, some little pockets are fine, but it's best to minimize them as much as possible. You should now have three long strands of dough half as wide as the originals. To get the most cinnamon swirl in each slice of bread (and not just three pockets full of sugar), fold each strand in half, widthwise, they should now be 10 inches (half as) long. Roll out again until they are 20 inches in length once more. Transfer to a parchment paper lined baking sheet. Pinch one end of the strands together. Braid the dough. Once you reach the end of the braid, pinch the other end together. Tuck any loose dough on each end underneath the loaf for the cleanest look. Cover with a clean towel and let rise another 30 minutes. 15 minutes before baking, preheat oven to 350 degrees F. Using a fork, mix the last egg in a small bowl. Taking a pastry brush, coat the dough in egg wash, making sure to get all the crevices. Bake for 35 to 40 minutes. Cool completely before slicing.